The past few tutorials dealt with compiling the open source Ogg and Vorbis libraries. In the next few tutorials I will demonstrate how to play Ogg Vorbis files using these libraries. Before attempting to play an unsupported file format like Ogg Vorbis, it make sense to first understand how a supported file format can be played, so I will start off by showing how to play supported audio formats using AVAudioPlayer. Keeping private properties and methods avoids the interface in your header file become cluttered with details a user of the class need not know. In Xcode 4.5 you do not need to add a synthesize statement, but I still like to do it to explicitly give the property and instance variable distinct names. The downloaded project contains a file Rondo_Alla_Turka_Short.aiff. Add the following code to create a player loaded with this file. If you compile and run the project you should not be able to tap the Play button and the music will start playing. A timer can be used to periodically update the display when the audio is playing. The timer should be started when the user taps the Play button. Lines 5-8 create a timer that will call a method timerFired every 0.1 seconds. You’ll implement updateDisplay a little later. Let’s finish with the timer first. Line 3 stops the timer from firing and line 4 signals to ARC that the timer is no longer needed. playback stops due to an error. The latter two cases can be dealt with using delegation and the AVAudioPlayerDelegate protocol. To begin signal to the compiler that your view controller will be implementing the AVAudioPlayerDelegate protocol, open IDZViewController.h and add the protocol to the interface definition. We’re now finished with the timer, time to turn our attention back the updateDisplay method. The reason for using a separate method to update the slider labels is that when you implement seeking you will want to be able to update them separately from other display elements. You should now be able to compile and run the project, and all the UI controls should update as the audio is playing. A seek feature can be added by completing the implementation of two methods that were included in the skeleton project. This code stops the display update timer so that the user’s dragging is not being contradicted by the current position and also updates the slider labels so the user knows where they are dragging. You could also stop playback if you wanted to, but I prefer letting it continue until the user releases the slider. 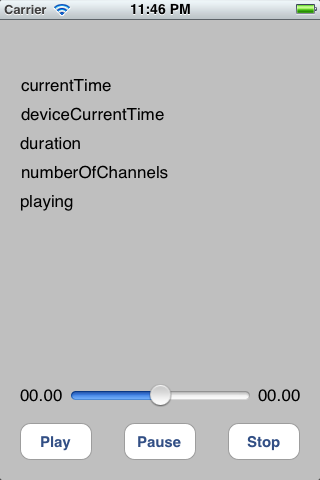 This stops playback, sets the player’s currentTime property to the value of the slider, and restarts playback from that position. This entry was posted in Tutorial and tagged AVAudioPlayer, AVFoundation. Bookmark the permalink. Hi Alex, thanks for the feedback. I really am hoping to write up the custom AVAudioPlayer soon. I am traveling at the moment and am finding it difficult to get time to sit down and write. Also, sometimes my access to internet connections is not so good. Heeeyy!!! Hello IDZ long time no reading from you, Happy new year!! hope you are ok and my best wishes to you in this brand new year!! Yes, life has really got in the way of blogging in the last few months. For the few weeks I was at home, during the holidays, we were moving and now I am traveling again. Luckily here I have good internet connections and some quiet places to work, so hopefully I will do some blogging soon. Thanks for your encouragement, I hope you have a great 2013 too. Your post are very informative and helpful. I already own an app which uses open source code from vlc to convert the video and audio, but I am looking to better the code as some videos which play on iphone, don’t play on ipad. I am looking for a team of experts to build me an app to support video and audio for ios5 and ios6 and support all devices. The app needs to support the “Open In…” feature (I have the code for this). I have another developer currently working on the vlc issue but then I came across your comments and was wondering if you would be interested in developing a stable media player…? Between my day job and this blog I don’t have much spare time at the moment! Best of luck with your project. Great zone for developers, continue the good work! Start an amazing Audio Player for IOS instantly by using IOS MUSIC PLAYER CODE SCRIPT – [REDACTED BY iOS Developer Zone]. Thanks for the encouragement. If you would like to promote your product on my site please contact me for terms. Otherwise do not comment spam. Thx for your work, it really helped me. But now I have an issue trying to play a ogg file on a 64 bit device. My current workaround is to change the architectures of my app project from armv7 and arm64 to armv7. Where could I be wrong? Here is a sample of what I get: “Undefined symbols for architecture arm64″ for functions ov_time_seek, ov_clear, ov_read, ov_time_total, ov_open_callbacks and ov_info. It seems that Ogg.framework and Vorbis.framework I found on your GitHub are not compiled for arm64: “missing required architecture arm64″. please tell me, how can we add numberofloops in IDZAudioplayer ? Currently it has to be an absolute path. Apologies for the delay in responding. Spam makes it hard to find genuine comments.